Hi there guys i am using a new laptop with a ati Radeon hd2450 For bve and would like help setting the graphics up too get the best out of it. Its a compaq presario CQ56 i love too zoom out in the cab and see everything but some trains when looking out of the window when driving the down a straight track the track seems too be more too one side. could someone help, also its a widescreen. That's no problem of OpenBVE, that's a problem of the train addons. I was planning to do an extensive post with explanations etc. for train devs, because this also disturbs me greatly (I always feel the urge to turn my chair leftwards xD). What you need to do is run them in windowed mode and adjust the size of the window to one that's not widescreen, but as large as will fit on your laptop and looks OK to you. The other answer, is that we all redraw and configure them to fit on your laptop widescreen. Sorry Steve, but I think that's not correct to link window size and viewport with each other. In my opinion, after having checked the documentation and played around, the error indeed is on the addon's side. If I understand the way both functions "center" and "origin" in the "[This]" section work correctly, both must have the same "x" value for all normal rail vehicles. Only this way, dead ahead is dead ahead. Quork wrote: Sorry Steve, but I think that's not correct to link window size and viewport with each other. In my opinion, after having checked the documentation and played around, the error indeed is on the addon's side. 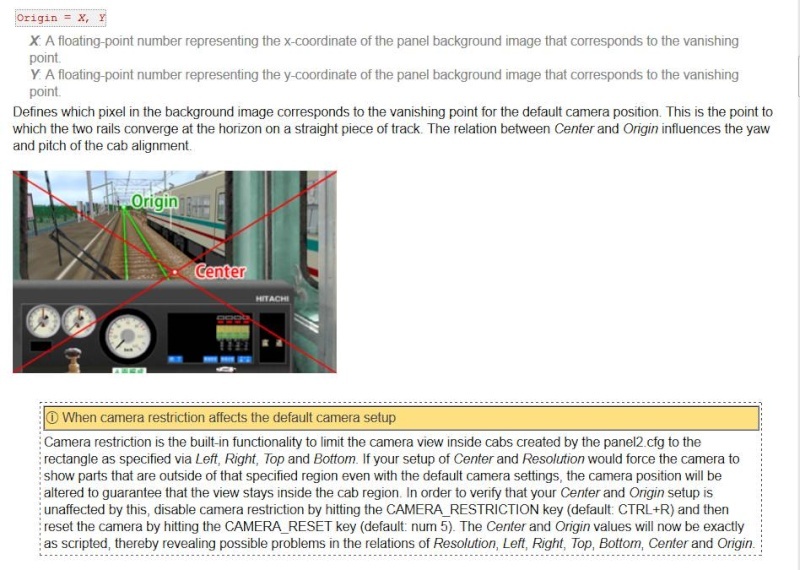 If I understand the way both functions "center" and "origin" in the "[This]" section work correctly, both must have the same "x" value for all normal rail vehicles. Only this way, dead ahead is dead ahead. True, but that does not take in to account the variables encountered with the photo's used to actually make the cab. There's always quite a few in reality that would be major work to correct or a case of it not being made in the first place. So they have to be a compromise, out all the ones I've done I think there's only a couple that have the same x value. Sorry to bother you, but could you please sketch up what you mean? Becuse I do not really unerstand. I mean, if I took a photo of the cab pointing somewhere far left up, so that the main part of the panel, the vanishing point etc are all in the photo's lower right corner, I could still set [center] and [origin] to the same spot or to spots differing only vertically, resulting in the basic view in OpenBVE to be realistic. While if I took a photo of the cab from some position far from where the driver's head would be side- or heightwise* it wouldn't make for a correct view no matter where I set those two parametres. * a photo position further behind than the head usually is is no problem or rather even useful on some vehicles to correct for the fact that a photo with the same wide angle as a human eye has suffers from strong perspective issues at the borders. That's what I already mentioned in our mail exchange about the 175: The documentation itself suggests a wrong use of the parametres. The centre should be set at the same heigth as it is now, but straight below the origin. Only this would result in a correct viewing direction (as opposed to the current one with the driver looking sideways, which is unrealistic unless you're driving a Diema DL6 or similar...). Yes, of course, it would also result in the image being further cropped in normal view (especially on panoramic screens), meaning moving the centre up (or the origin down) to decrease the height difference should be considered.